CHAMP is a cleaner/degreaser that performs superiorly due to its synergistic mixture of natural, citrus solvents and its unique surfactant system. 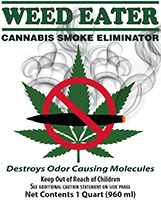 Not only is CHAMP non-toxic and non-flammable, but CHAMP also out cleans most solvent cleaners even though many of them contain highly toxic compounds. CHAMP is excellent for nearly any cleaning task from factory to kitchen. 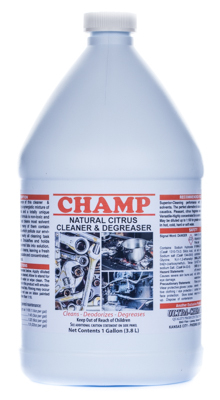 CHAMP emulsifies and holds heavy grease, oil, and animal fats into solution for easy and quick removal. In addition, it instantly deodorizes as it cleans, leaving a fresh scent of citrus. Furthermore, this advanced, non-butyl formula is biodegradable and concentrated; therefore, CHAMP is also economical.